In 1996, if I'm not wrong, there was a conference at the New School in honor of David Gordon, who had just passed away. The late Andrew Glynn, gave a very nice talk, but he said something that left me uneasy. For him, the NAIRU (Non Accelerating Inflation Rate of Unemployment) was our concept, meaning by our radical economics' idea, not mainstream's idea. The point was that the NAIRU, in contradistinction to Milton Friedman's natural rate, does not imply full employment. The NAIRU does suggest that output is supply determined, and that expanding demand beyond that level is inflationary, but the fundamental reason is that after that the bargaining power of workers increases and leads to wage-price spirals. This could happen way before the economy is fully utilizing its productive capacity, and would depend on social factors like the relative strength of the trade unions, for example. While that is correct, I noted, after the conference, that this still meant that demand had no role, in this view, in expanding the capacity limit of the economy (my students are rolling their eyes, and saying there he goes with Kaldor-Verdoorn again!). Glynn's reply was a quote from a title of paper by David Gordon. My views implied too much cumulation and not enough contradictions. The notion is that if you think that the demand determines long term growth we should live in a paradise with full employment, since demand can be managed. "When consumers are constrained, so is hiring, because without customers, employers are hard pressed to retain workers or make new hires." Yep, the Times got effective demand right (it must be a Krugman thing)! However, no fiscal package is at hand to solve this simple technical problem. I'm not going to explain Republicans and American politics (wouldn't dare). But the political contradictions associated with expanding demand are staggering. It's a pity that only now I have a good answer for Andrew. PS: The paper by David cited above is Gordon, D. "Kaldor's Macro System: Too Much Cumulation, Too Few Contradictions." In Nicholas Kaldor and Mainstream Economics, edited by Edward J. Nell and Willy Semmler, pp. 355-83. New York: St. Martin's Press, 1991. An important point in the conservative (sound finance) argument against the increase in public debt, and the need for fiscal adjustment is that higher debt-to-GDP ratios would eventually lead to higher real interest rates. In other words, the increase in debt would imply that economic agents would demand remuneration for holding government bonds. 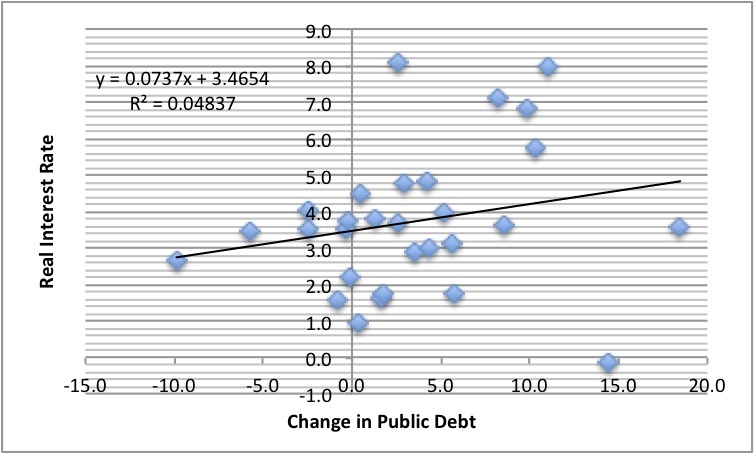 The figure below shows the correlation between the change in public debt and the real rate of interest on bonds, between 1981 and 2009. The result shows that an increase in the debt-to-GDP ratio of 1% leads to an increase of the real rate of interest on bonds os 0.07%. In other words, the effect is in economic terms insignificant. Much ado about nothing. PS: As Nate Cline and Franklin Serrano kindly noticed, causality most likely runs from the rate of interest to debt. Sure thing; the point here is just to note that even if the conservative point was correct, the actual effect would be insignificant. "So even with substantial deficits, the pace of long-term budget worsening is very slow." It is not difficult to understand debt dynamics. The ratio of debt to income (GDP) is a measure of the capacity to repay debt. 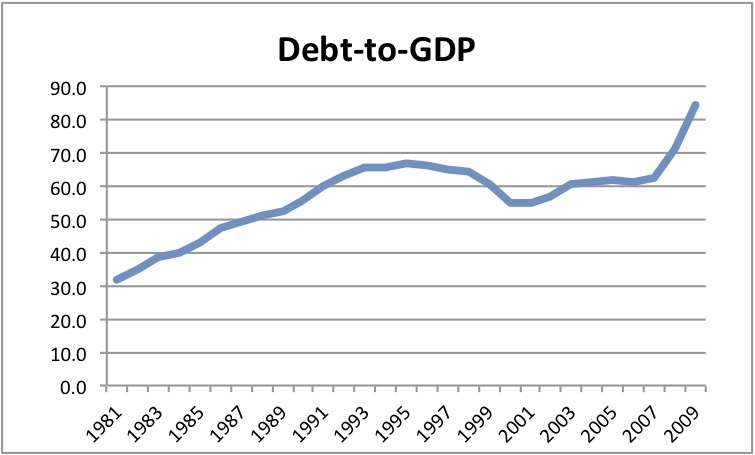 If the economy grows faster than debt, the debt-to-GDP ratio falls. GDP grows with demand expansion, and debt grows at the pace of the interest on the debt. In other words, if the economy grows faster than the rate of interest, then the debt-to-GDP ratio will fall even if the government runs deficits. The graph below shows the growth rate and the real rate of interest on government bonds for the US since 1990. As it can be seen, since 2003, with the exception of the Great Recession, the rate of interest has been below the rate of growth. 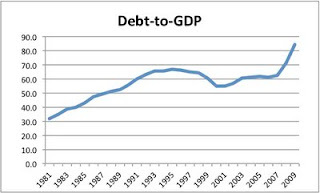 The debt-to-GDP ratio has only increased (see graph below), because the crisis has caused significant deficits to accumulate. 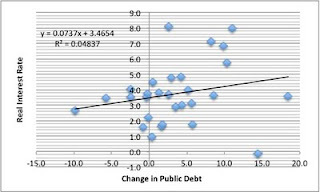 Note that in the 1990s, a combination of lower interest rates, higher growth and fiscal surpluses had stabilized debt, which starting growing in the Reagan years. Finally, note the growing deficits in the figure below have reversed with a very mild recovery in 2010. Interest will remain low. What is needed is a stronger recovery to get growth going and that would increase revenue (allow for reduced spending on several things like unemployment insurance) and eventually lead to a lower debt-to-GDP ratio. The way out of the fiscal problems is growing! Even dummies should get this right. Are the Latin American Economies Overheating? The IMF has suggested in their last Regional Economic Outlook Report that the Latin American economies that have recovered swiftly from the global financial crisis may be at risk of overheating. Read the rest here. This is a bad time to be an economist. If you were fresh from the womb and had no past opinions to defend, if you had never said anything notable before, it might be a fine time to be an economist. If you are one of those soap-opera characters who has complete amnesia and no memory of anything that they ever said or did or any intellectual position they took before January 1, 2010, it might be a fine time to be an economist. But for the rest of us--we who are now looking back at our opinions and analytic judgments and statements and pronouncements of the past 15 years and thinking: "how could I ever have been so stupid; how could I have missed so much?" --it is a bad time to be economist? Four years ago we economists were writing learned papers about the "Great Moderation": about how it looked as though the governing institutions of the world economy had finally learned how to control and moderate if not completely eliminate the business cycle--the epileptic seizures of the economy that leave us with pointlessly high unemployment, pointlessly idle capacity, and pointlessly rusting away machines in spite of there being no fundamental cause for machines to be idle, factories closed, and workers unemployed. Funny, I know of several economists that suggested that an economy based on debt-led consumption, on the basis of asset bubbles, was not sustainable and that a crisis was coming. It would be tedious to cite all, and I'm lazy and don't want to find links to their papers, but a limited list of names (do a google search) would include Dean Baker, Jane D'Arista, Jerry Epstein, Jamie Galbraith, Wynne Godley, Thomas Palley, Bob Pollin and Lance Taylor (before hand I'm sorry for any significant omissions). I knew enough to be sure that it was not sustainable. But I'm glad that the best in the mainstream admit that it was stupid not to see it coming. I would suggest to him that part of the problem of the inability of the mainstream to see it coming is their theoretical framework. The consensus macroeconomic model, based on an IS curve, a monetary policy rule, and a Phillips Curve with a natural rate of unemployment, in particular because it assumes that the economy automatically returns to the natural rate, is a flawed basis for understanding the real world. There is a lot of fuss about who should be the next managing director of the IMF. The French have held the position for more than 30 years, and a European has always been at the helm of the IMF. Thus, the voices of protest for a broader representation, more transparency and a democratic process have been raised. Raghuram Rajan, former chief economist at the IMF, has suggested (subscription required) that we need a technical/market economist rather than a politician running the Fund. In other words, the independent guys that deregulated financial markets, imposed brutal contraction in the European periphery and commanded over the Mexican Tequila (Zedillo inherited the crisis from Salinas, to a great extent, but shared the neoliberal principles) respectively (among other things). It would be like having Count Dracula in charge of the Red Cross blood donation program. Further, Mr. Rajan peddles the need for a non-European to head the IMF and cites the usual names (Armínio Fraga, Trevor Manuel, Montek Ahluwalia, Tharman Shanmugaratnam, only missing Agustín Carstens in the lists of developing country’s economists cited for the position). The common denominator is that all of them would maintain policies that are essentially more of the same, and will not push the IMF to revise their adjustment policies. If these are the candidates they might as well appoint a European to do the dirty job! The question is not so much whether the selection is done by notables (even though one may want less notorious people than the ones in Rajan’s list) or other lesser beings, or even whether the new managing director will come from the colonies (sorry, the developing countries) or Europe. The question is whether the IMF is going to change its ways and understand that pro-growth and employment generating policies should be painful to capital, not labor. We need capital controls and fiscal expansion, to create jobs. 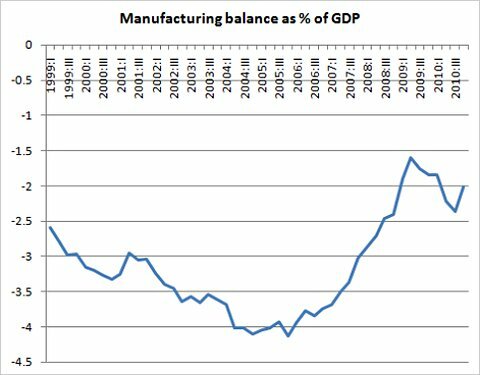 Krugman correctly points out that depreciation has had a role in the reduction of the manufacturing trade deficit in the US (above). However, he forgets to say that the recession was also instrumental in reducing the deficit. While he is correct that those that are afraid that depreciation would lead to the collapse of the dollar (a hysterical exaggeration), and do not see the positive role of a depreciation, it is also true that the reduction of the deficit is not all good news. A reduction that results from a recession is hardly good news. Note also that it is important to explain why the manufacturing sector is key for the economy. 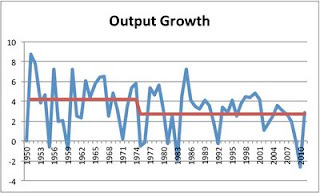 Nicholas Kaldor used to argue that it is manufacturing growth that drives productivity change (and that productivity in agriculture and services is derived). In that sense, as I noted before, even though employment in the sector have shrunk and the trade balance in the sector has been perennially negative, the US is still the leading innovator in the sector. Heterodox economics is often defined as potpourri of of schools, too many to mention. Further, most of these heterodox schools are defined against marginalism (or neoclassical economics, which is also a fragmented school of economic thought). In this sense, the heterodox camp is defined in a negative (against orthodox) and fragmented (depending on what aspect of orthodoxy is contested) way. I think that is a counter productive approach, and that heterodoxy should be seen as a set of principles. A positive (in its own terms) and unified (in the sense of the minimum set of propositions that are universally accepted) definition of heterodoxy is necessary. Two things are central from my point of view. First, heterodox economists are concerned with the amplified reproduction of society, and this implies that the production and distribution of the social surplus is central for their theories. This is part of a tradition that harks back to classical political economy. 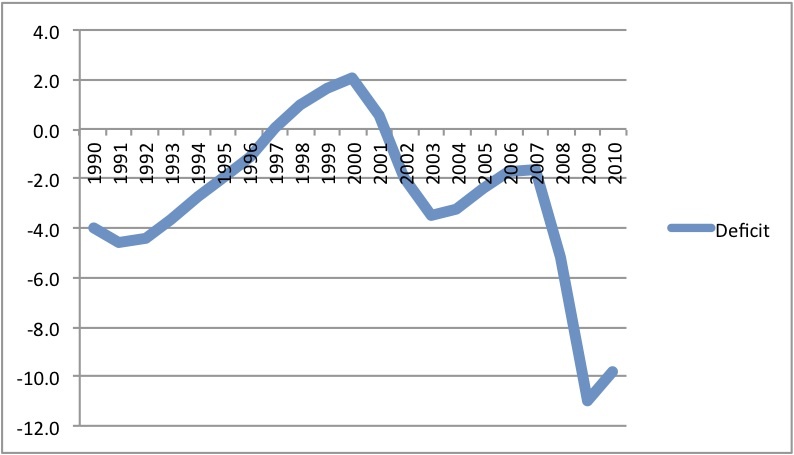 The determinantion of the surplus implies that distribution is determined exogenously by social and institutional conditions (be that the real wage as affected by the bargaining position of the labor class, or the rate of profit as determined by the monetary rate of interest influenced by the central bank). Further, the determination of surplus, for an externally determined distribution, and a given technology, provides an explanation of relative prices (value). It is important to note that there are several particular theoretical ways of approaching each of these questions associated to the reproduction of the economy. For example, some Marxists emphasize that relative prices are proportional to the amounts of labor directly and indirectly needed to produce the commodities. Sraffa provides a different approach, that is compatible with Marx's views of the working of the economy. Post Keynesian groups that emphasize the determination of prices according to full cost pricing are also compatible with this general preocupation about the determination of the social surplus. In other words, several schools of thought are heterodox in the acceptance of the necessity of understanding how the surplus is generated and distributed, even if they have different theories (that are not always compatible among them). The second essential proposition that defines heterodoxy is related to the theory of output and employment determination. 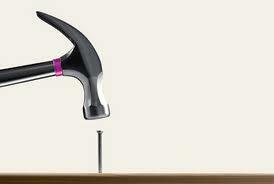 Heterodox economists believe that output is demand determined. That is, autonomous spending determines the level of activity. There are a few implications to this simple proposition. First, the level of autonomous spending will only generate full employment of productive resources by chance, and unemployment is a permanent feature of the economic system. Second, as the level of income equilibrates savings to investment, the rate of interest must be a monetary (not real phenomenon). Additionally, heterodox economists argue that effective demand is valid in the long run. In sum, if one believes that prices reflect, for a given technology, the way classes struggle for higher income shares within the process of reproducing the material conditions for survival (including processes in which there is accumulation), and one believes that output and the process of accumulation are driven by the exogenous forces of demand, one may be called heterodox. Some other issues are often seen as central for defining heterodox economics. Endogenous money is a typical example. And it is true that most, if not all, heterodox economists follow some version of endogenous money theory. However, it is clear that even if money is not endogenous, the rate of interest is still a monetary variable in heterodox economics (e.g. in Keynes' General Theory). Also, several mainstream economists have endogenous money, from Wicksell to those using the Taylor rule now. The same could be said about true or non-probabilistic uncertainty. It is important, but neither the determination of prices of production or effective demand are directly affected by uncertainty. And several Austrians (hardly heterodox according to the criteria above) are very fond of the idea of uncertainty. The last additional issue that sometimes is used to define heterodoxy is complexity (or non-ergodicity), but is the least relevant. The main difference between heterodox and orthodox are related to causality issues, and they can be reproduced in simple or complex theoretical frameworks. The obvious question that anyone may pose is why does it matter to define heterodox economics precisely. For example, Colander, Holt and Rosser (CHR) suggest that heterodox economists should not consider themselves heterodox but just economists, and try to influence the mainstream working with the best among the orthodox. The problem is that logic and evidence can support either prices of production or supply and demand, and, by the same token, either Say's Law or Effective Demand must be wrong. In economic policy compromise might be possible, but in theory principles cannot be compromised. I replied to their paper here (see the addendum). PS: My paper is published in the Journal of Post Keynesian Economics, with CHR's reply (subscription required), and in an edited book by Fred Lee and Marc Lavoie (here). 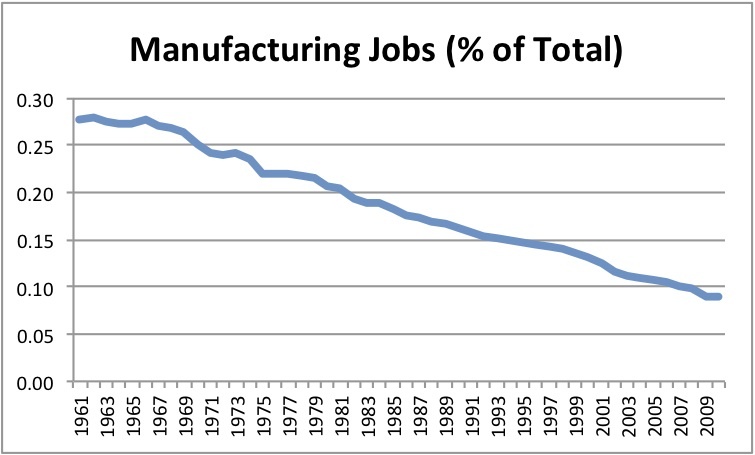 Manufacturing jobs have declined precipitously in the United States since the late 1960s. As the graph below shows they fell from 28% of total employment to 10% last year. The decline is continuous, and, one should add, precedes NAFTA and other Free Trade Agreements, (FTAs) which are often associated with the process of deindustrialization in the US. That the topic is old should be highlighted by the fact that the classic on the subject is Barry Bluestone and Bennett Harrison’s book published in 1982. However, if one looks at the absolute number of manufacturing jobs, rather than their share in total employment, a slightly different picture emerges. 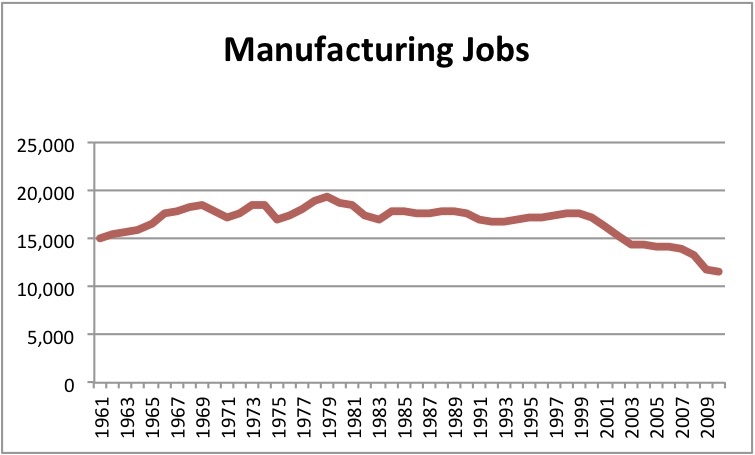 First, manufacturing employment grows up to 1979 (peaking at around 19 million jobs). In other words, the fall in the manufacturing employment share from the 1960s to 1979 is fundamentally the result of a rate of employment growth in the manufacturing sector lower than in the economy as a whole. 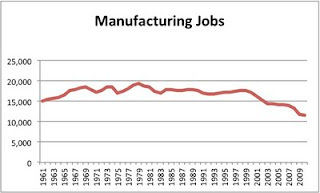 From 1980 manufacturing employment basically starts falling slightly up to 1994, and from 1994 to 2000 it grows only a trifle, fluctuating around 17 million jobs. Interestingly enough, 1994 is the year of the implementation of NAFTA. The whole period from 1980 to 2000 is a period in which the share of manufacturing employment falls, not just because employment grows faster in other sectors, but also because it stagnates. 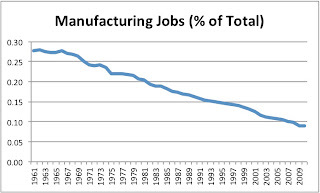 However, after 2001 (the year China entered into the World Trade Organization, WTO) manufacturing jobs collapse, with only 11.5 million jobs in 2010. This may suggest that, in part, one may have to revise Bob Rowthorn’s view that North-South trade has no role to play in deindustrialization. But clearly the process that starts in 1979 is of a different nature. One view is that it represents a natural result of economic maturity, and that faster growth in manufacturing implies more workers absorbed in the services sector. 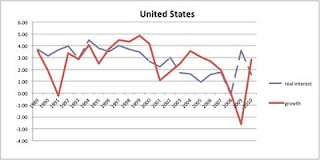 I would suggest, but not elaborate too much here, that deindustrialization in the United States, and I mean the post-1979 phenomenon, is part of a strategy of accumulation, which was based on lower wages and higher interest rates, with demand pushed by increasing the debt leverage of the private sector (as suggested in another post). 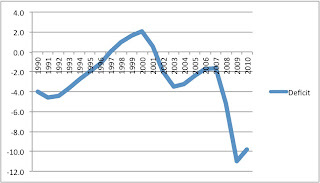 The weakening of the unions (and FTAs have played a role in this), and the move of manufacturing jobs abroad (mostly to Asia), and, as a result, deindustrialization, are part of the pattern of accumulation since the 1980s. However, this should not be read as a general weakness of the United States industrial sector. Block argues that there is a hidden developmental State in the US. In that sense, deindustrialization has not been a sign of the weakness of the US, or of the demise of its hegemonic power, as some on the left would argue. On the contrary, is part of the renewed American Hegemony, which has been maintained at the cost of certain sectors, and, in particular, of its working class. (...) was built on a satanic derivative structure called the CDO-squared. A normal CDO is a giant pool of loans that are chopped up and layered into different "tranches": the prime or AAA level, the BBB or "mezzanine" level, and finally the equity or "toxic waste" level. Banks had no trouble finding investors for the AAA pieces, which involve betting on the safest borrowers in the pool. And there were usually investors willing to make higher-odds bets on the crack addicts and no-documentation immigrants at the potentially lucrative bottom of the pool. But the unsexy BBB parts of the pool were hard to sell, and the banks didn't want to be stuck holding all of these risky pieces. So what did they do? They took all the extra unsold pieces, threw them in a big box, and repeated the original "tranching" process all over again. What originally were all BBB pieces were diced up and divided anew — and, presto, you suddenly had new AAA securities and new toxic-waste securities. The other thing, is that there is plenty of evidence in the Levin Report is more than enough to indite several managers at Goldman, in particular, Daniel Sparks, the head of the mortgage division, that lied under oath, when he claimed that they did not expect the securities that they were betting against were going to be downgraded. PS: The original post was accidentally deleted by Blogger. 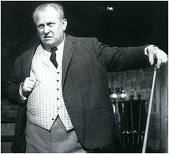 The guy on top is Goldfinger, a lesser villain than the guys at Goldman. 1) How long will inflation expectations remain anchored? 2) How long will the bond market trust the United States? 3) How long will it take for the economy’s wounds to heal? The reply to the first (I changed the order) is pretty good, in part because it dismisses the whole exaggeration about the role of expectations (what people think you think they might think will actually happen). Also, and more importantly Dean emphasizes that wages have been subdued (to say the least; and one might add with unemployment at this level and years of weakened unions no chance of recovery anytime soon), and the only source of inflationary pressures are higher commodity prices. He elegantly puts aside Mankiw's nonsense about the credibility of the Fed. "The idea being pushed by many in policy circles that at some point the bond markets will lose faith in the ability of the U.S. government to pay its debts is absurd on its face. This would be like saying that if I issued iou's, that were payable in my iou's, that the markets would be worried about my ability to meet my commitments." It is, in fact, a very common idea, even in progressive circles, as I noted in my previous post. Mankiw's notion that a day of reckoning for US debt is inevitable is disingenuous, which seems to be a pattern in certain mainstream circles. On this I should say that all so-called New Keynesian economists, that is, those that think that involuntary unemployment might exist, and did not fall for Real Business Cycles and other crazy theories (please somebody explain to me how the last crisis was a real one! ), that have advised Republican governments (John Taylor, in his recent rants against Krugman, is another example) are in a similar pickle. They have to defend ideas (e.g. cutting taxes for the rich) that are clearly wrong for political reasons. This means that Republicans are left with cranks that actually believe in supply-side economics and Santa Claus, and reasonably informed neoclassical economists that say things that they know are not quite correct. But on question two, as Dean notes, if insolvency is not a problem, and inflation is not going to get out of hand, interest rates will remain low and there is no reason why the government cannot go on borrowing to finance its deficits. If anything deficits should be larger. Which gets him to the last question. And yes, he asks how could "honest economists debate" whether the recession was actually worse than expected. Dean is to nice to say that they might be clueless, in which case they should not be teaching in the "best" universities or writing for the Times, let alone advising government, or they are just not honest. And yes, we do need more stimulus. PS: Democrats have the reasonably well informed neoclassical (mostly New Keynesian) economists, but also some very good heterodox economists (which do not get the amount of influence they should, but that's another story). In the Democratic camp the reasons for crazy things, like the belief that deregulation would increase financial stability, followed the monetary incentives (let's call it that). But at least most of their economists do believe that unemployment is a problem. Again in a previous post I suggested I would deal with the issue, which seems to be apropos, since there has been a certain discussion in the blogosphere about the so-called Modern Monetary Theory (MMT) approach (see here, here and here). First, I should clarify that the discussion to which I refer tends to conflate two different issues. One is the question that I will deal here, what are the constraints faced by the government in managing its budget, and the approach associated with MMT in this case is basically what used to be called functional finance, a tradition that harks back to Abba Lerner and Evsey Domar, and to which Keynes eventually agreed. The other issue is related to the causality between money and economic activity, and is part of what in more modern times has been called endogenous money. The debates on this issue are older than the Bullionist/Anti-bullionist and Currency/Banking schools, and in modern times the endogenous money (anti-bullionist-banking) view was developed by Nicholas Kaldor and Basil Moore among other names. The reason the two issues tend to be conflated is that printing money is one way to finance government spending, and there is a traditional connection between sound finance and monetarist (exogenous money) views. Again, what could be the solvency issue if the debt is denominated in a currency that the government controls? He may have issues with the consequences of printing money, but not with the fact that money can be printed. So solvency is NOT, and cannot be an issue. What are the consequences of monetizing debt then? Long ago the authors of the Banking school (e.g. Thomas Tooke) noted that if more money is pumped into the system agents would spend the money or pay their debts (the second case is known as the reflux mechanism). If they pay previous debt, the money has no effect on the level of activity. On the other hand, if they spend and firms have extra capacity output must increase. Note that firms normally have extra capacity, and can produce more at the same price, contrary to the textbook (U-shaped) cost curves. But what if the economy is at full capacity? Then it is clear that excess demand may have an impact on prices (or, if instead of monetization, the government prints more debt agents may demand higher rate of interest to hold it). The question then is whether the economy is at full employment and what determines full capacity, not whether monetization is always inflationary (which clearly would only be the case if the economy was always at full capacity; unless Krugman and Rognlie agree with Lucas, this could not be the case for them). However, note that it has been accepted that the supply constraint is variable (the mainstream refers to it as the Time Varying Non Accelerating Inflation Rate of Unemployment or TV-NAIRU). The important question regarding monetization is what determines this supply constraint that imposes an inflation barrier to demand expansion, what Friedman referred to as the natural rate of unemployment (note that natural was meant to suggest that policy cannot affect it). Here it is also important to note that one component of demand, investment, does have an impact on the supply side. In other words, investment has a dual effect, it is a component of demand (more sales of equipment) and it creates more supply capacity in the future (when the equipment is installed). So, as the economy grows, firms try to adjust their capacity to demand, so as to keep up with the economy, and avoid loosing market share to competition. This suggests that one of the reasons for the variation of the supply constraint is the expansion of demand itself. It should be noted that this does not mean that the supply constraint is never reached, but it is clearly a rare phenomenon. 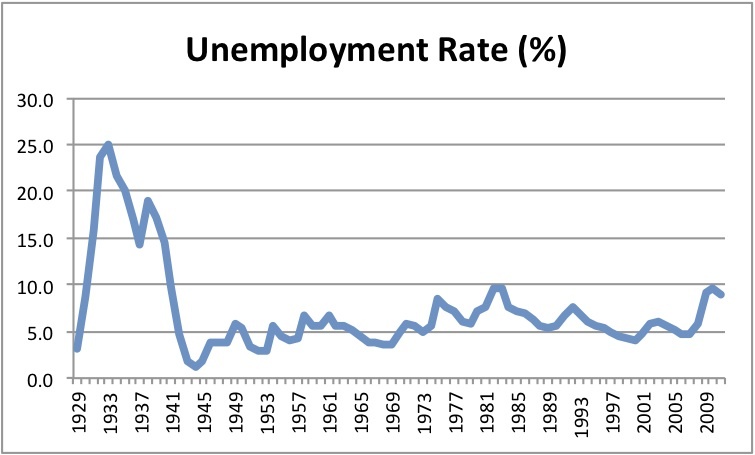 The graph below shows unemployment in the United States from 1929 to 2011. 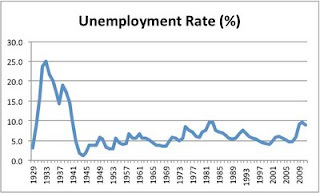 Only in four occasions did the annual average unemployment fall below 4%, in the mid-1940s, the early 1950s, the late 1960s and the late 1990s (all during Democratic administrations, by the way, with the exception of 1953). Inflation did accelerate in the first three, when the economy, because of war efforts (WW-II, Korea and Vietnam), was most likely close to full employment (I’m more skeptical about the 1960s, since inflation really picks up in the 1970s, and oil shocks where more important than full employment), but not in the last. Even in those cases, only in the first public debt was actually growing, and the size of the deficits (more than 20%) was incredibly large. Interest rates did not increase significantly in any of these episodes either (this seems to be Rognlie bone with MMT). This is the evidence that is used to suggest that governments have a constraint and beyond that inflation ensues? And that is taken as serious thinking on money and deficits! I would agree with Robert Vienneau that this is “unjustifiably arrogant” dismissal of MMT, to say the least. Part of what I have referred to as the incredible persistency of monetarist views (even among more progressive economists). Let's suppose that the Treasury actually says to the People's Bank of China, sorry, we can't write a check to you right now. Well, in the case of the People's Bank of China, the bond that they hold would become a defaulted bond, but it would still be there. And the Treasury would still recognize its obligation on that bond and would presumably be willing to pay accrued interest on it. The Treasury would probably say, it's going to be a few days while we resolve this, and the People's Bank of China would, in my view, probably do nothing. If I were sitting in the position of a foreign holder of U.S. Treasury securities in that situation, the last thing I would want would be a panic. I would want this problem to go away. And by the way, Standard & Poor's doesn't matter also. "Dollar declines haven’t brought woe in their wake in the past: neither the huge decline after 1985 nor the sustained decline during the Bush years — both of them dwarfing anything we’ve seen recently — brought catastrophe; in fact, both were associated with OK economic growth and mild inflation. In some cases, currency declines have caused major balance sheet problems — but that’s because highly leverage players have large debts in foreign currency. US households are plenty indebted — but those debts are in dollars." Worth reading too on the same topic this (full disclosure: I'm favorably biased by what this guy says). A few years back Sam Bowles presented a paper (Kudunomics: Property rights for the information-based economy) at the University of Utah. At dinner he reaffirmed his conviction that Arrow-Debreu General Equilibrium (GE) is compatible with different kinds of behavior and can be a force for progressive economics. Conventional marginalist theory suggests that income distribution is the result of relative scarcities, and, as a result, real wages should equal the marginal product of labor, i.e. labor productivity. When asked how he squares the belief in GE with the fact that wages in the US do NOT follow productivity since the 1970s, Bowles seemed puzzled. And the relation of income distribution and growth remains puzzling for the mainstream and its sycophants. In the heterodox camp, the discussion has been centered, for the most part, between the so-called Kaleckian and Kaldorian models. First, I should note that from a history of ideas point, the Kaleckian name is a misnomer. Kalecki’s models where about the interaction of multiplier and accelerator, with shocks and lags, to produce fluctuations. In the various forms of his accelerator equation Kalecki included a trend, producing fluctuations around a trend. The so-called Kaleckian models derive from Harrod and Joan Robinson’s attempts to extent Keynes’ Principle of Effective Demand (PED) to the long run. The PED says that an increase in investment is matched by an exact increase in savings, and that the level of income is the main adjusting variable (rather than the interest rate as in the Loanable Theory of Funds). The Kaleckian models basically normalize the IS identity by the capital stock, assume (in the extreme case) that the propensity to save out of wages is zero, and a propensity to save out of profits (s) between zero and one, and in Keynesian fashion have investment determine savings. The difference with the short-run story is that now accumulation (investment-to-capital ratio) determines income distribution (the rate of profits), a result often referred to as the Cambridge equation. Where Ih is the response of investment to profitability and Iz to capacity utilization. Assuming stability, that is, that savings respond to profitability more than investment to capacity utilization and the denominator is positive, the sign of the equation depends on the numerator. If investment is strongly responsive to profitability (Ih > sz), then the system is profit-led (exhilarationist in B-M terms). If not we have the wage-led (stagnationist) regime. As I suggested in my previous post, there are some theoretical problems with the type of model used to argue that the US economy is profit-led, besides the empirical ones alluded before. The independent investment function suggests that capacity utilization affects capital formation, if capacity is low there is more investment, and vice versa when z is high. In other words, firms would try to adjust capacity to demand. If that is the case you would expect that a normal relation between capacity and demand would be established in the long run (in the neoclassical view demand adjusts to capacity; that’s Say’s Law), which could be seen as the relatively stable output-to-capital ratio over the whole period for the US, in my previous post. If that is the case, investment is determined by the adjustment of capacity to exogenous demand in order to reach the normal capacity utilization, and it is essentially derived demand (the accelerator principle). It is not instrumental in determining the normal level of capacity utilization, which must be determined by the exogenous components of demand. This is the basis of the supermultiplier models, first developed by Hicks, and then by Nicholas Kaldor, and referred to as Kaldorian in the heterodox literature (for more on that see this paper). That is the essential difference between the Kaleckian and Kaldorian models, whether investment is partially autonomous and determined by profitability or it is derived demand. Of course income distribution in Kaldorian models might have ambiguous effects on growth, but firms would not investment more if profits went up, if there is no increase in demand. In this sense, worsening income distribution might lead to higher growth if demand keeps going for some reason (say more private debt stimulates consumption; or stimulates the consumption of a higher income group). But in general profit-led growth that stimulates investment, as in the M-B framework seems hard to explain from a theoretical point of view. Hence, the confusion it generates empirically (e.g. in the case of the US the notion that a debt-led consumption boom is a profit-led story). PS: The typical Kaldorian model is based on Thirlwall's work, but the book by Bortis and Serrano's dissertation (or his paper; subscription required) are essential readings. Is the American economy profit-led? In a recent post I showed the evolution of real wages and long-term real rates of interest in the United States from 1950 until now. 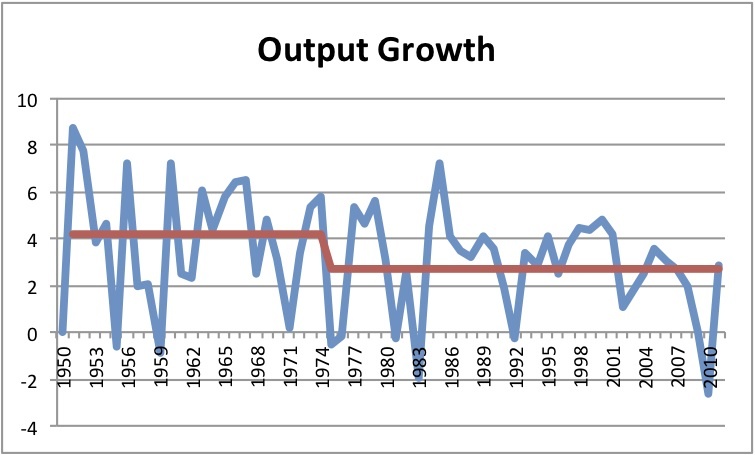 The figure below shows the real rate of output (GDP) growth for the same period. Between 1950 and 1973 the average (red line) rate of growth was 4.2% and in the subsequent period it was 2.7%. In other words, the change in income distribution dynamics, with a significant slower rate of growth of wages, was accompanied by a significant reduction in the pace of economic growth (we also saw in the previous post that it also went hand in hand with higher real rates of interest). Many authors (e.g. the late David Gordon), in particular when looking at the evidence post-1970s, argued that the American economy is profit-led. In other words, as profits (some emphasized profit shares while others prioritized profit rates; the profit rate time the level of capacity utilization gives the profit share) expanded, it stimulated investment, and this, in turn, led to output growth. 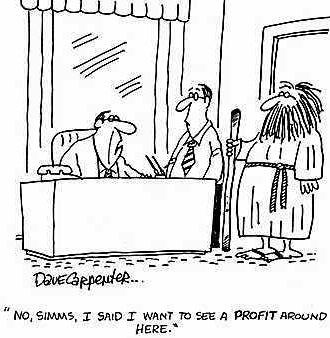 Growth was driven by profits. The idea is that, even though the reduction in wages has a negative effect on consumption and output growth, this is more than compensated by the increase in investment. However, there are some empirical problems (there are some theoretical issues that I’ll deal with in another post) with this kind of model (often referred to as Kaleckian, even though it seems that their origin should be traced to Joan Robinson’s Accumulation of Capital and the influential formalization by Bob Rowthorn in the early 1980s). For starters, growth actually fell significantly after real wages stagnated. 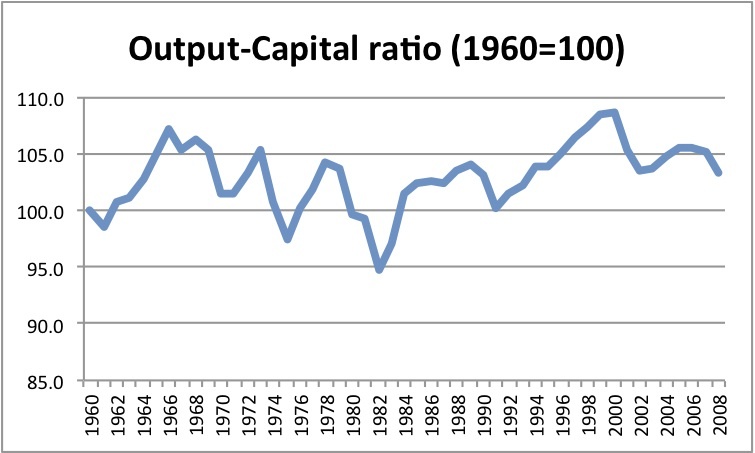 Also, the output-to-capital ratio (shown from 1960 to 2008 using a OECD measure), as can be seen in the graph below, does not indicate a marked shift in the 1970s. 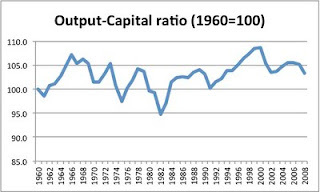 The output-to-capital ratio goes up in the Johnson and Clinton booms, and falls otherwise. The Reagan boom was mild at best. This is consistent with the accelerator. As the economy moves closer to full employment, the output-to-capital ratio, a proxy for capacity utilization, moves close to its maximum. The accelerator would suggest that investment adjusts capacity to output. Investment is not the locomotive of the system, is the rear car (the idea behind the accelerator principle). Since the 1970s the drivers of accumulation in the United States have been consumption booms driven by debt accumulation. In other words, as Barba and Pivetti have argued, increasing debt has allowed American families to continue to consume, in spite of stagnated wages. This has been mistaken in the empirical literature as a profit-led boom. The suggestion here is that the booms have continued to be driven by consumption (as in more traditional wage-led cases), and that the benefits for capital have been financial and associated to higher interest rates. The last three booms have been more Wall Street debt-led booms, rather than profit-led investment booms. Wall Street, not the Silicon Valley, defines the current American economy. After all, we all remember Gordon Gekko’s “greed is good” (uttered in real life by Ivan Boesky) and nobody remembers an iconic phrase by Bill Gates! What would Galbraith ask Bernanke? Jamie Galbraith endorses the demand for transparency in the management of the Fed, which is central to Senator Bernie Sanders's audit bill. Here is a critical view of the Fed, that does not ask for its elimination, like representative Ron Paul, but public control and accountability of the Fed actions. He would also try to democratize the Federal Open Market Committee (FOMC) meetings.